A young girl named Liesel Meminger’s life is changed forever the day her brother dies. Her mother drops her off at a couple’s home on a street called Himmel (also “Heaven”). This girl, trapped in the rising and falling world of Nazi Germany, must question who and what she values the most when a Jew comes into her family’s household seeking shelter. The Book Thief follows her story as well as those of others, all who will fight for a place in your heart. Liesel is only nine when The Book Thief begins, but she’s fourteen by the book’s end. It’s sort of like a coming-of-age story, but in a way it’s also not. It just follows how she matures and how she deals with everything thrown her way, and how she escapes the horrors of everyday Nazi Germany life with words. 1. Her escape through words is really inspirational. 2. The friendship she forms with such a big variety of people is also inspirational. 3. The symbolisms of several different things in the book are breathtaking. 4. 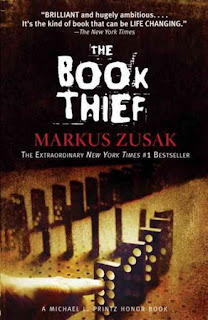 Markus Zusak’s writing style is different, using a lot of metaphors and choppy sentencing, and the book has a voice unlike that of I’ve ever read. It’s fantastic, but I’ll understand that some people have trouble not liking it as much. I just think it’s fantastic though, very enthralling. There is an enormous cast of characters and the author keeps you interested in all of their stories, keeps them all balanced. It’s hard to get confused at any point in this book, as everything is explained bluntly. Hm... I think those are some clear enough reasons, so I’ll halt there. I’m so sorry this post is late! I had my birthday last weekend, so I lost track of time and completely forgot to do any blog posting. Catching up now! Thanks for checking in and staying with me, mateys. Off to check out your own ports soon enough and what wares you have on display!